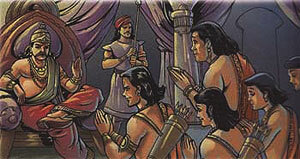 The Pandavas were the princes of Hastinapur. The reason they were so called was because they were the sons of Pandu, the king of Hastinapur. The first three Pandavas - Yudhishtira, Bhima, and Arjuna - were the sons of Pandu's first wife, Kunti, and the youngest Pandavas- Nakula and Sahadeva - were the sons of Madri, Pandu's second wife. King Pandu and Madri had died, so Kunti brought them up. All the five brothers had great qualities. They were brave and intelligent. They had learnt many arts and mastered weaponry. Yudhisthira, the eldest, was known for his truthfulness and fond of eating. Arjuna was a great archer and was a favourite with his elders. There was a lot of love and brotherhood among them.